NO REGRETS. I think I know what it is supposed to mean, but it bothers me the message that this simple slogan is sending. When someone says “No Regrets”, I think that for the most part they just mean that they believe and embrace the fact that everything in their life, both good and bad, has been used to get them to where they are. I understand and agree with that sentiment. But to boil that down to “no regrets” is really doing us all a disservice. I say yes regrets. I sure do have some. To start with, I regret that when I was five years old, I told my gymnastics instructor it was my birthday. I thought I was being clever, and I was going to follow that up by telling him it was really my half birthday, but he had the class singing to me before I could do so. I felt so horribly guilty. Another early regret…that short haircut I got at age 12. (Since braces and puberty weren’t making me awkward enough.) Silliness aside, most of the things I really regret are the times that my words or actions have hurt others. I regret times when my words cut my husband deeply, or I was not attentive to things going on with him. You won’t see me posting anything like “Married for 15 years to the love of my life. Wouldn’t change a thing.” I would definitely change some things I’ve done and unsay some words. If you really didn’t have regrets, what would be your motivation to be a better person? How could you set new goals for yourself? Part of recognizing areas you’d like to grow in is seeing your weakness. And how do those weaknesses play out? As actions that you very likely regret. I am an introvert. Meeting people is hard for me, and spending time with people I don’t know well is hard. It’s so much work that frankly, sometimes I’m just too exhausted to do it. But there are times when I have not made the effort that I hurt others. My attitude has come off as disinterested in them or unfriendly. It grieves me that I’ve given others that impression, and that regret motivates me to make changes in my life where I can be true to my own personality but still make room for others in this way. 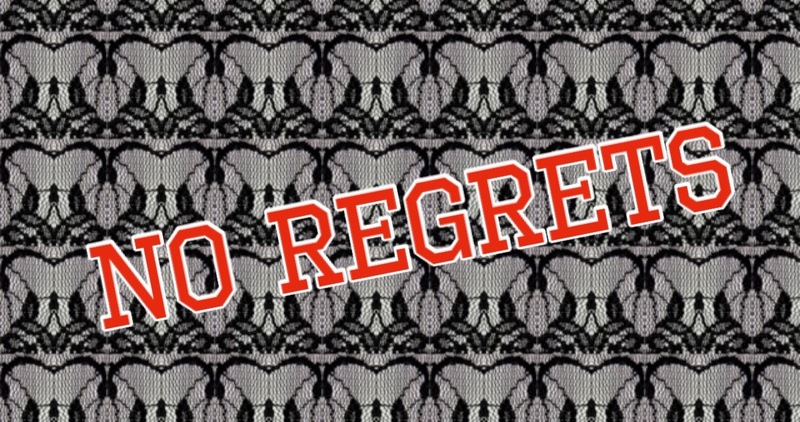 I wonder if my children seeing the words “no regrets” will take that slogan to mean moral relativism. “I’m so glad about all the good AND bad stuff I’ve ever done. What’s the point in trying to do only good? It was all used to get me to where I am, so I should just do whatever I want.” I want, for myself and for my children, a higher standard. I want them to recognize their mistakes and sometimes feel regret, and a desire to make different decisions next time. Regrets have helped me identify the areas in my life that I can work on next. Regrets guide my prayer life and make way for growth. If you say you don’t have any, maybe you should reconsider.